ST. JOHN'S, Newfoundland - Kyle Platzer and Matt Foget tallied their first goals of the season, but the Florida Everblades fell to the Newfoundland Growlers, 3-2, in the regular season opener for both teams on Friday night at Mile One Centre. The Everblades (0-1-0, 0 PTS) scored twice in the third period to claw back to a one-goal difference, but the Growlers (1-0-0, 2 PTS) closed the door en route to their first win in franchise history. 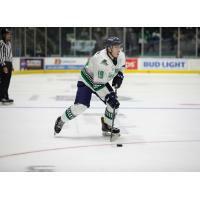 The Everblades tallied twice on the power-play goal to close the deficit in the final frame. Platzer collected a low rebound and got the 'Blades on the board halfway through the third. Foget then scored with 1:24 left in regulation against Newfoundland goaltender Eamon McAdam to make it 3-2. Between the two 'Blades power-play goals was the game winning goal by the Growlers' Sam Babintsev. Babinstev beat Blades netminder Jeremy Helvig on the glove side. The Growlers opened the scoring in the first period as Kristians Rubins found the back of the net for the season's first goal at the 2:47 mark. Not only was it the first goal in the 31st season of the ECHL but it was also the first goal in Newfoundland Growlers' history. The Growlers tacked on another goal to increase their lead to two. Matt Bradley streaked past the 'Blades defense as he beat Helvig on a backhanded shot over his glove. McAdam made 21 saves in the game for Newfoundland and earned the win. Helvig stopped nine shots in the first, nine shots in the second and 10 more in the third but suffered the loss in his 'Blades regular season debut. The two teams will square off again on Saturday night at 5:30 p.m. ET, the final meeting between the two sides this season. Ticket packages for the 2018-19 season are on sale now! Become part of the Everblades Family with a Full Season, Partial Season or a Flexible Voucher Package that fits your schedule and budget! All Ticket & Voucher Packages provide savings and special benefits! To view the Ticket & Voucher Package options CLICK HERE. Ask about the payment plan options too!